They were calling for 2-4 inches of snow in the mountains and everyone went running to the store to buy milk. I ran to my food processor to make homemade hot chocolate. No one can sled without a steaming hot cup of cocoa after and we were out. This is my second batch of this creamgoodness. My kids love it with mini marshmallows or whipped cream for an extra treat. I highly suggest making it with milk or at least half milk and water for the little ones. It really is like an after dinner dessert. When you see the real ingredients you’ll know why. Run or walk to your nearest store and pick up powdered milk if you don’t have any. You probably have all the other ingredients on hand. Wouldn’t you know, we didn’t receive any snow? Oh well, we’re stocked and ready. 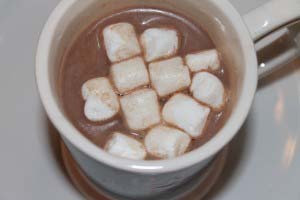 Now sit back and enjoy a hot cup of real homemade hot chocolate with me, will you? Whisk together ingredients in a large bowl. Working in three batches, pulse the ingredients in a food processor until the chocolate is finely ground. 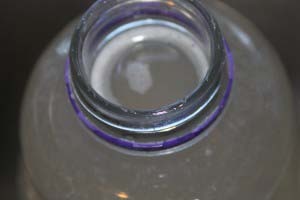 Store the dry mix in an airtight container for up to 3 months. Add 1/3 cup of the cocoa mix in a mug and stir in 1 cup of hot milk. Top with whipped cream or miniature marshmallows, if desired. I’ve been using regular cocoa, but I can’t wait to try the dark chocolate. This would be the perfect Valentine gift in clear cellophane bags for teachers. Add some heart marshmallows and we’re good to go. Who would you give homemade hot chocolate mix to? This entry was posted in Beverages on 18.01.2013 by admin.